The online casino took gambling to a whole different level, and yet the human element was missing. The arrival of live dealer games bridged that chasm and made for an amazing online casino experience that gave you the best of both worlds – the comfort and security of the online casino and the thrill of playing against a beautiful girl who is the dealer. You played at an online casino but interacted with real-life dealers and croupiers. The first online casino game to be offered at live dealer casinos was blackjack. Live blackjack is one of the most popular of all live dealer casino games. The game has a dealer you play against; this is usually a beautiful girl you will definitely want to talk to. The dealer deals the cards and generally runs the game. The action is usually out of a land-based casino or the software provider’s live casino studio. It is then filmed and streamed live over the Internet to the player. On this page we will take a look at the unique form of blackjack that is live blackjack. To play a game of live blackjack this is what you need to do. 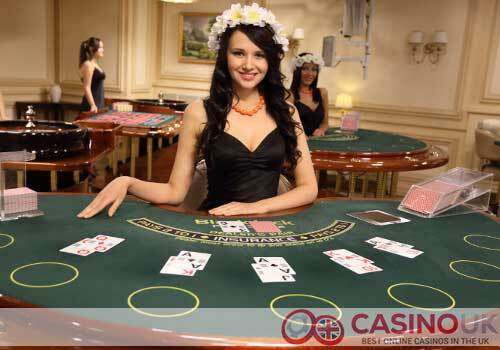 Find a UK online casino that offers live dealer games. Click on the Live Casino tab on the casino’s home screen. Sign in or sign up by providing the required information. Deposit funds into your account if it is not there already. Click on the variant of live blackjack you want to play from the games on offer. Place your bets for the dealer to start dealing. The 1-to-many format games are different from the 7-seater and VIP table games. There are multiple players from multiple locations and one dealer. The dealer accepts wagers from the different players at one go. He then deals a single hand that the different players see and respond to from their respective locations. Microgaming: Microgaming has been one of the pioneers of the online casino software industry. Its live blackjack games are among the most sought after. The following are some of the features of its live blackjack variants. Playtech: Playtech is another big name in the casino software industry with a great range of live blackjack games. There are 5 variants available. The common variant comes with an 8-deck shoe. NetEnt: There are different variants of live blackjack games available from NetEnt. One of the unique offerings from NetEnt driven by innovation is Live Common Draw Blackjack. The game can accommodate hundreds of players and work with multiple currencies any time. Find a table; you may have to wait if you are looking for a particular live blackjack game. Remember to fund your account. You can do this using any of the deposit methods available. You have to know the different play options for each hand and the rules, which are the same as that of a regular blackjack game. Use the chat feature to interact with the dealer; you cannot talk to the dealer but you can definitely hear what she or he has to say. Blackjack table: This is the view of the table where the action is unfolding. Card view section: This is the section where you see the cards as they are dealt. The camera zooms in during the deal to show you the cards in large size; after the deal the camera zooms out to give you a full-table view. Dealer section: Usually towards the top/top left of the screen, this section shows the dealer in action. Acquiring and maintaining the high-end equipment including camera, lighting, and software. Live blackjack has a low house edge usually, but that depends more on the software provider. It could be anywhere between 0.50% and 6.95% for a 7-seater game. There could be variations for other games. The payout remains constant at 3:2. The live dealer makes a huge difference as she/he brings in a much-needed human element. The social quotient is higher than that of a regular blackjack game at an online casino. The ambience of an actual land-based casino or live casino studio is worth its weight in gold. The live dealer actually slows down the pace of a game compared to a RNG. Higher minimum bets compared to a regular online blackjack game can be a deterrent for many.